"In developed countries many good ideas are funded while great ideas in developing countries are missed out on. I would focus on education and provide forums on creativity and innovation that listen to everyone’s ideas. This would go a long way to improving the planet," says Kashyap Pravin Gohel, a graduate from the Aga Khan Academy Mombasa, when asked what he would focus on to improve the lives of people if he had all the resources at his disposal. Kashyap Gohel has been pursuing a Bachelor of Architecture programme at the Jomo Kenyatta University of Agriculture and Technology (JKUAT) in Nairobi, Kenya since graduating from the Aga Khan Academy Mombasa in 2011. "My top marks at the Aga Khan Academy earned me a government scholarship which is about 85% of the annual fees for my architecture course of six years," says Kashyap very proudly. He expects to graduate from JKUAT in June 2017. "I think the main values the Academy instilled in me were positive attitude, time management, assertiveness, competitive spirit and self-confidence. These are values that I apply on a day-to-day basis to form the foundation of a successful career in art, product design and architecture," Kashyap says confidently. He also adds that the confidence that his skill set gives him takes him further than most in trying challenging and new projects in his field. With this experience in mind he says, "I am sure I shall be quite a pioneer in creating world-changing ideas." Kashyap believes the coursework at his university and his time management are going smoothly due to the intense training at the Aga Khan Academy. "Coming from the Academy, I believe it set me a level ahead of others, enabling me to go further than my fellow students." He also values the International Baccalaureate curriculum. "It is the only system that I know of that makes it possible for one to develop holistically. One does not just learn academics, but also extracurricular activities, leadership skills, developing talents and solving community problems," he says emphatically. Since graduating from the Aga Khan Academy, Kashyap has participated in many major events and activities that have brought him recognition and accolades. He was a winner of the Perstorp Open Innovation Challenge 2016 in Sweden which involved submitting ideas on making, repairing and remolding furniture into new shapes and designs rather than disposing of used or broken pieces in landfills. Kashyap has also won the Disruption by Design Award for architectural design in 2015. Other accomplishments include being awarded a tender to create a 14-foot-tall carving at Jomo Kenyatta International Airport in Nairobi, Kenya in 2014 and winning the first round of the Thought for Food Challenge 2013 – an annual competition that challenges university students to develop an innovative solution to improve food security. He also won an international graphic design contest for an Irish boat-making company and has displayed his artwork at Diani Beach Art gallery, Tazama Art Gallery and Kenya Art Fair. 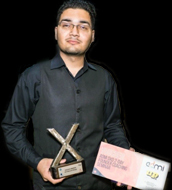 Kashyap was also nominated and sponsored to attend the One Young World conferences in Pittsburgh, USA in 2012, and in Johannesburg, South Africa in 2013. These summits gather the brightest young leaders from around the world, empowering them to make lasting connections and develop solutions to some of the world's most pressing issues. Kashyap is particularly proud of his first community service project, called Project Desert Farms. He designed this as an architectural solution to help communities on the coast to filter ocean water, obtain housing and food, and reduce deforestation. This project was selected as a finalist project from a worldwide participation of 140 teams, and the only one in Africa that made it to the Thought for Food Global Summit in Berlin, Germany. While at the Aga Khan Academy Mombasa and after graduating in 2011, Kashyap has been actively involved in many projects and volunteer activities and has also worked for the Academy and other companies in his field. In 2011 he worked with planning and construction management at the Aga Khan Academy. He also volunteered there as a theatre teacher for years 7–10 in 2012 and was involved in the design of two of the Academy’s residential blocks. Kashyap's most unforgettable experience at the Academy was being a dorm captain in the residential programme. "One of the things I miss about the Academy is the organisation…[and the] efficient order in the way it operates," he comments. Another thing he misses about the Academy is the facilities. "It’s only after leaving the Academy that you appreciate the constant high speed Wi-Fi, adequate number of desks and chairs for students, high-class sports facilities and equipment, and most of all the great ocean climate and friendly people. As they say, nothing beats home," Kashyap reminisces nostalgically.